Summer in New York City is full of wonderful things, from patio brunches to ice cream cones in Central Park. But we all know, living in NYC makes a hefty dent in our wallets, which makes free things that much more rewarding. We understand fully that concerts can be a big portion of our summer expenses, but they don't have to be. Some of your favorite acts this summer are playing for free, keep tabs with our list of the ten best free shows. In chronological order we're going from spring to the end of summer. Next week we're curating the music for a mini-festival pre-party for the Brooklyn Half Marathon. It's free so bring the whole crew, family, or posse. With headlining sets from Here We Go Magic and Oberhofer, as well as a DJ set from Jukebox the Ghost, there's no reason not to go. Click on the link above to see our spiffy lineup and its set times. Here's "How Do I Know" from Here We Go Magic. Perfect for some summer sauntering, six-time Grammy nominated Janelle Monae will be a good kick-start to the season. Listen to her saucy track from the Rio 2 soundtrack. Celebrate the summer solstice with the Dum Dum Girls, Hospitality, and TEEN. Check out this video for "Lost Boys and Girls Club" off the Dum Dum Girls' latest album Too True. 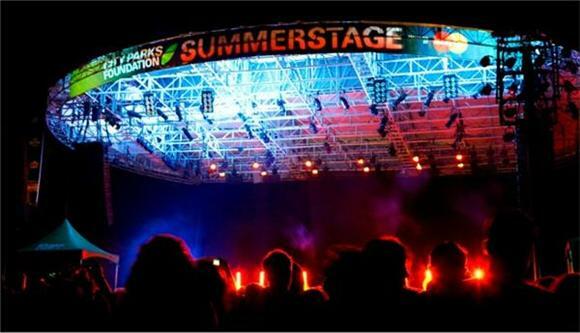 Folk legend Andrew Bird (and The Hands of Glory) along with Luke Temple (Here We Go Magic) are playing a show as part of Central Park's popular free Summerstage series. It will surely be a good, relaxing show to bring the family midsummer. For a sample of Andrew Bird's performance, here's a video of "A Nervous Tic Motion of The Head To The Left" at Bonnaroo in 2006. British producer Bonobo is bringing his sultry beats to Central Park along with Cibo Matto, and Odesza. This is probably the best opportunity to see an electronic show for free this summer. Take a look at Bonobo's spinning video for "Cirrus" below. Deltron 3030 were a major part of the first two Gorillaz albums, the group consists of producing geniuses Kid Koala and Dan the Automator, along with American rapper Del the Funky Homosapien. After last year's release of their first album in 13 years, Deltron 3030 is back and a must see hip-hop act for the summer. The futuristic geniuses will play with Montreal natives Nomadic Massive. Hear their recent release "City Rising from the Ashes" featuring Mike Patton. Jose Gonzalez made famous for his cover of Swedish band The Knife's song "Heartbeats" will be playing with yMusic to perform orchestral versions of classic indie acts. They will perform works by Nico Muhly, The National's Bryce Dessner, and Son Lux. Here is Jose Gonzalezs cover of "Heartbeats". It's been a big year for St. Vincent, with the release of her highly acclaimed self-titled album, she's rocketed from minor to major in the past few years. This could be a huge closer for Celebrate Brooklyn's series of free concerts at Prospect Park. St. Vincent will play with San Fermin for the season's finale. Watch St. Vincent's hit single "Digital Witness" off her recent album below. British singer and composer Devonte Hynes will provide a perfect ending to a summer of fantastic free concerts. Performing along with Moses Sumney and Sean Nicholas Savage, Blood Orange's haunting tunes will hold you over through the winter. Listen to "Chamakay" from Cupid Deluxe.